Fujifilm FinePix F30 Zoom digital camera is the successor to the Fujifilm FinePix F10 and F11, and is the world first digital compact with ISO3200 sensitivity. 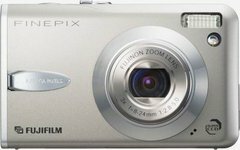 Fujifilm FinePix F30 features 6.3 million effective pixels 1/1.7″ 6th-generation Super CCD, 3x optical zoom FUJINON lens, RP Processor II, Intelligent Flash, ISO3200 high sensitivity mode, 230,000 pixels 2.5-inch LCD monitor, PS (Picture Stabilization) mode, 0.01 sec. shutter delay, 15 kinds of Scene Position including Natural Light, Natural Light & with Flash, Portrait, Landscape, Sport, Night, Fireworks, Sunset, Snow, Beach, Underwater, Museum, Party, Flower-Close Up and Text. F30 also has internal memory of about 10MB, and single charge can shoot about 580 photos with high capacity battery. DigiCamReview highly recommends Fujifilm FinePix F30 with overall rating of 8/10 and concludes that the Fujifim F30 is an impressive compact 6 megapixel digital camera with a 3x optical zoom lens and a large 2.5″ display. The camera is one of very few to include ISO 1600 and ISO 3200 modes. It has excellent responsiveness and is designed to be able to take great photos in almost every situation. Although some people may find the re-styling and altered usability not necessarily to everyone’s taste, overall there have been many usability improvements – Particularly welcome is the improved higher resolution screen. The FujiFilm F30 is well worth considering – there are few digital cameras that offer so many options, so much quality, in such a small package. ComputerAct!ve concludes with overall rating of 4 out of 5 that it’s a camera with a specific purpose, the FujiFilm FinePix F30 achieves low light photography in areas in which rival compacts would struggle to get a picture. The F30 but doesn’t offer a compulsive argument for upgrading from the F10 or F11, but is one of the more attractive and better performing compacts available. Steves DigiCams reviews Fujifilm FinePix F30 and concludes that the FujiFilm Finepix F30 is an awesome digital package. With its unmatched ISO capabilities, great image quality, robust performance, durable metal body, and loads of useful exposure modes, the F30 is tuff to beat in the 6-megapixel category. While its retail price of US$399 is a bit more expensive than many of the other 6-megapxiel models, we feel that its versatility and advanced features allow it to still offer a great value.